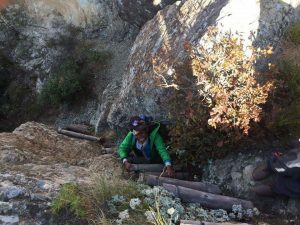 Scouts experience the thrill of the Drakensberg! 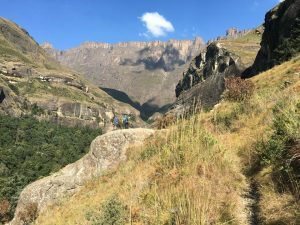 Earlier in June 20 members of the 1st Honeydew Scouts Group went on the hike of a lifetime when they got to experience the thrills, beauty and treasures of the Drakensberg. “The idea for the hike was born last year ” explains Scout Group Leader Neil Webb. 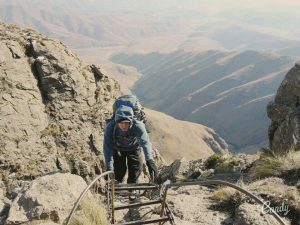 “Both our Troop Scouter Roald and I are experienced Drakensberg hikers and I was very keen to expose our Scouts to the thrills of a Drakensberg experience.” Fitting it in to their busy schedule was a challenge, but Roald pushed through and the Scouters decided that a winter hike would be feasible provided they planned it thoroughly. A few months later a hiking party comprising of 5 Scouters, 1 Rover, 1 parent, 4 senior Scouts and 9 junior Scouts embarked on four days of fun! 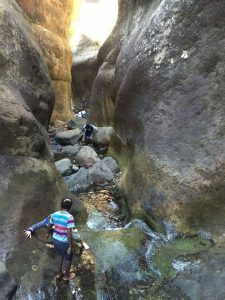 The third day the younger Scouts braved the ice and snow and got to see and taste the water in the Thukela Gorge. For First Class Scout Peder, hiking through the snow and standing on the ice in the middle of the Thukela River was the highlight of the trip. “The taste of the water was much better than in Jo’burg!” said Blake who obtained his Pathfinder. Adventure Scout Tamryn enjoyed going up the chain ladder to discover an amazing view and the glistening snow! Click here for more photographs of the hike. A good Akela is patient!